This project aims to promote discussion about gentrification faced by La Perseverancia , a district in central Bogota. A common mechanism in these processes is the elimination of the memory of neighbourhoods in order to cancel the sense of belonging to a place, thus facilitating the removal and replacement of those who live there.The memory at La Perseverancia is clearly rooted in its identity as a working-class neighbourhood and its history is closely linked to the Bavaria brewery and Jorge Eliecer Gaitan, a popular Liberal leader killed when running for president , leading to the Bogotazo, popular riots and the sacking of the capital of Colombia in 1948. Gaitán baptised La Perseverancia as the "Red Belt" of Bogota. To forget the historical struggle and break their rebel memory is the first step in weakening community ties and the possibility of collective action . The intervention is formalised through the creation of a physical signpost with one of the most representative phrases of the labour movement: Amunt els de baix (Rise up, those below). 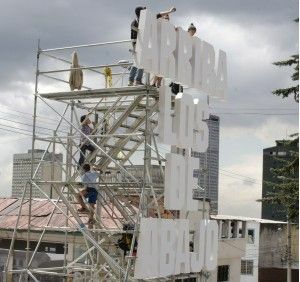 This volumetric signpost is set to one side of a scaffold, so as not to block the view of La Perseverancia and its conflict, as well as to bring attention and value to elements of identity. 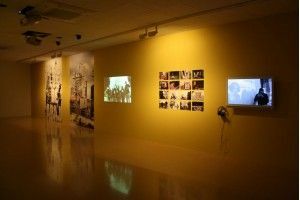 A project with the collaboration of Caldo de Cultivo and Todo por la Praxis with the La Perserverancia neighbors of Bogotà, and the production of La Otra Bienal.